Gov. Jerry Brown has gotten a lot of credit for California’s fiscal rebound. When he came to office, the state budget was running a deficit of $27 billion; now, as Brown leaves office, he’ll leave his successor, Gavin Newsom, with a $15 billion rainy day fund. Thanks, Jerry! But Californians actually should be thanking other, richer Californians. Under the state’s progressive tax structure, 46 percent of state income taxes are paid by the top 1 percent. Tales of the rich supposedly fleeing the state’s high income taxes are hardy perennials, but California still leads the nation in billionaires, and recent studies have found that, among higher earners, California has experienced a net gain. In fact, one such report, by Stanford University’s Center on Poverty and Inequality and the state Franchise Tax Board, came out this year right around the time a famous 1 Percenter announced that he was departing the snow belt to join the Los Angeles Lakers. LeBron James has been, in theory at least, a California taxpayer for several months now. How grateful should the rest of us in the Golden State be to him for his contribution? As an illustration of the state’s fiscal dependence on the wealthy, and perhaps as solace to the shivering fans James left behind in Cleveland, let’s count the ways. 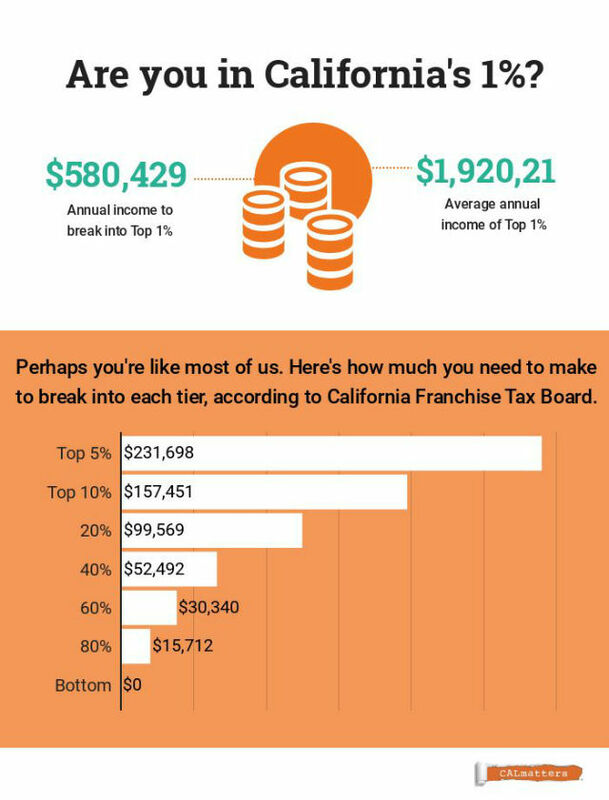 First, what is a California 1 Percenter? It’s those making at least $580,429 a year, according to the state Department of Finance. And the average earnings of the 1 percent? $1.9 million. That’s 23 times more than the average California filer’s $83,256 income. Celebrities, moguls and techies don’t just pay out of their paychecks, but any time they cash in on their investments. As a result, California’s income taxes are much more volatile because the state treats capital gains, partnership income and dividends, interest and rent—all the ways the rich make their money—the same as wages. Newsom says there are a variety of approaches to help stabilize the state budget, including a sales tax on services, changing property taxes, adding an oil severance tax, and adjusting income tax rates. While he acknowledges the risk, he hasn’t endorsed any plan yet. Over the course of his four-year $153.3 million contract, James could pay more than $20 million in California income taxes. That’s about $1 for everyone in the state workforce. It’s also more than double what he would pay in Ohio if he kept his residency there. Now, how do I know James will file as a California resident? Well, I don’t know for sure and the Lakers haven’t called me back. But circumstantial evidence suggests the bean counters at the California Franchise Tax Board will figure it out. “They know everything,” quips Larry Pon, a CPA based in Redwood City. “This one client said he lived in Florida but the FTB agent asked, ‘How he’s in Florida, when I see ATM withdrawals in Sunnyvale and credit card charges in Palo Alto?’ Another guy claimed he wasn’t a resident California but there’s a passport stamp showing the day he arrived in California. Where you are taxed is generally based on residency and work. California checks off both. There’s his $21 million mansion in Brentwood. Then there’s his second $23 million mansion in Brentwood. And his son, LeBron James Jr., attends a private school in Santa Monica—you can catch the video of LeBron Sr. in the stands at his basketball game on YouTube. Even as a part-year resident, he’ll pay on the games he’s played in California since signing with the Lakers in July. All professional athletes pay to the states where they have games, says wealth manager Rob Seltzer of Seltzer Business Management in Century City. 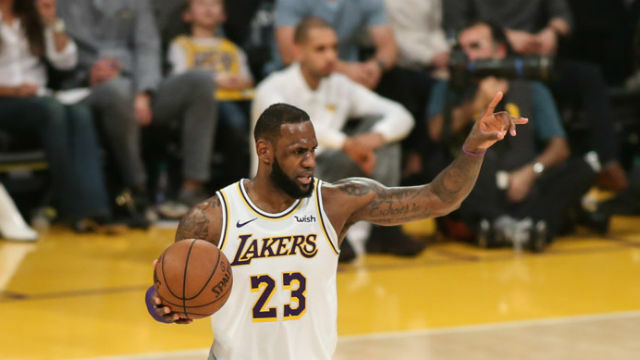 “If he decided to stay in Ohio, he would then have California residency for the 41 home games he has with Lakers, as well as for the games that he plays on the road with the Clippers, the Warriors and other California teams,” Seltzer says. Assuming he is a Californian, he’ll get taxed at the state’s top tax rate of 12.3 percent plus another 1 percent on income in excess of $1 million. However, he will get to claim some credit for taxes paid to other states. For example, his games in Portland, Phoenix and Denver will be taxed at 9.9 percent, 4.5 percent and 4.6 percent, respectively. Complicating matters for James—and a lot of wealthy Californians—is the loss of a highly prized tax deduction that’s thought to have played a role in flipping seven of 14-GOP-held congressional districts to Democrats. The Tax Cuts and Jobs Act, passed by a Republican-controlled Congress and signed by President Donald Trump, put a $10,000 annual cap on the deduction for state and local taxes (SALT). By comparison, the Pew Charitable Trust found Californians claimed an average of $18,438 in SALT deductions. Anti-tax advocates see such rules as incentives for the wealthy to move to states with lower taxes. Tax preparers say it’s hard to be so definitive. California’s warm weather and quality of life makes it an attractive place to live. It’s also an attractive place to do business as the home of Hollywood and Silicon Valley. On Dec. 21, state demographers announced more people came to California than left, bringing the total population to 39.8 million. “For however business unfriendly that California is, its appeal on so many other levels overrides those negatives,” Seltzer said.